Steve Rogerson compares two memories of football legend George Best that summed up the player’s life – that of a great footballer whose skills brought crowds to their feet or that of a fallen hero, struggling with alcoholism. One was brought to life on a special night at Old Trafford, and the other in a bar in Dubai. I remember when I was just 14 years old in 1970 my parents taking me to Old Trafford to see a midweek League Cup tie between Manchester United and Chelsea. And I remember being mesmerised when the unmistakable George Best picked up the ball on the halfway line and dribbled it all the way into the penalty area, beating Chelsea defenders en route, before tapping the ball into the goal. The same match also saw a Booby Charlton screamer earn United a place in the next round. I can recall little else about the game, but who needs to remember more? Many years later, in 1991, I was on a work trip to the Middle East. I was staying in the Airport Hotel in Dubai, the bar of which was much frequented by ex-pats. The day after I arrived, the said ex-pats were gathering for a formal dinner, where the after-dinner speaker was George Best. This was obviously a big event for the local Brits, who were quite surprised when I declined their offer to get me a ticket. It was no surprise though to me afterwards to hear them moaning about the occasion. Best’s speech apparently had bordered on incomprehensibility due to the effects of alcohol. On a trip to the loo later I allowed myself a glance into the dining hall and spotted the once-great footballer slumped over a chair, barely awake. In many ways these two incidents sum up what most of us remember about George Best, the young, great footballer whose talent gave fans so much pleasure, and the older drunk, whose sad addiction ended his life too soon and left for many bitter memories that really should have no place for someone who was such a brilliant young man. 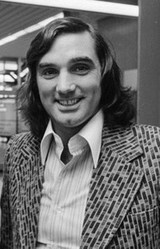 George Best was born in Belfast on 22 May 1946 and played football for Cregagh Boys Club and Lisnasharragh Intermediate School as he grew up. He was spotted by Manchester United scout Bob Bishop and joined the ground staff at Old Trafford in 1961. He turned professional in 1963 on his 17th birthday. Best's League debut was against West Bromwich Albion in September 1963 and he scored his first goal in his second appearance in a 5-1 victory over Burnley in December that year. He won his first Northern Ireland cap in a 3-2 victory over Wales, after only 15 League matches. That was the first of 37 Northern Ireland caps. Sadly, during his time as a Northern Ireland player, the team never qualified for the World Cup finals and thus Best never appeared on that ultimate of football stages. If there was ever a player that embodied the case of having a Rest of the World team made up of players from countries that failed to qualify in every World Cup finals, then George Best is that person. Best made 361 League appearances for Manchester United scoring 136 goals. He also holds the record for the most goals by a United player in a single match, six versus Northampton Town in the FA Cup fifth round in February 1970. United won the match 8-2. During his time at United, he won League championship medals in 1965 and 1967 and of course the European Cup winners medal in 1968, the same year he was named British and European Footballer of the Year. Off the field, Best opened fashion boutiques in Manchester. He also opened a travel agency and two nightclubs. In later life, he could be seen on Saturdays on Sky Sports commenting on one of the afternoon matches. After leaving United, he played for various clubs including Dunstable Town, Stockport County, Cork Celtic, Fulham, Hibernian, Bournemouth and Brisbane Lions of Australia. He also played in the North American Soccer League for LA Aztecs, Fort Lauderdale Strikers and San Jose Earthquakes. His greatest tribute came from Pele, who said that George Best was “the best player in the world”. The later part of his life story is mostly dominated by his alcoholism and related illnesses and not by the image of probably the greatest and most courageous dribbler football has known. I say “courageous” not lightly, because in Best’s days tackles that today would earn a defender a sending off were often not even punished by a telling off from the referee. Best suffered many of them in almost every game he played, but still came back for more with the grace and skill that were his hallmarks. I suspect when people look back on George Best’s life they will fall into the camps of either viewing him as a star who lost his way or just thinking about the magic with which he controlled a football. For me, I hope, it will be that night at Old Trafford in 1970 that will stay most prominent in my mind when someone says “George Best”.